This Garnet and Diamond Halo Gemstone Ring in 14K White Gold is solid proof that a simple style plus a timeless, stunning combination of gemstones equals one gorgeous ring. The striking contrast between a single red garnet and 0.40 carats of diamonds makes this ring a star. The perpetual glamour of this piece will allow it to turn heads in the present and for many years to come. 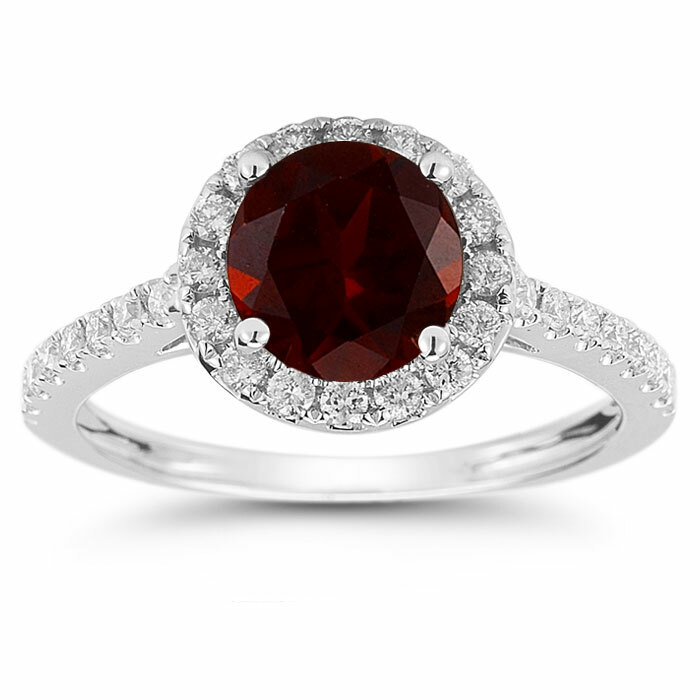 The enduring class of this halo ring begins with its center stone: a glittering round garnet. This 7mm semiprecious stone has a saturated crimson hue that's been winning it admirers for thousands of years, and this perpetually glamorous gem is a fitting star for this sophisticated piece. This rich color of this round garnet is contrasted in striking fashion by the 30 diamonds that accent it, making its color seem even more stunning and allowing it to pop. 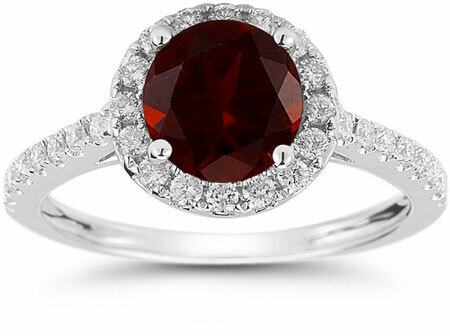 Accenting this gorgeous glittering garnet are 30 dazzling diamonds; these small round stones work together to create a frame of sparkle around the center gem and to give the slender band a dose of colorless glitz. Crafted from shining 14K white gold, the simple yet sophisticated setting of this piece provides the perfect, timelessly-elegant backdrop. We guarantee our Garnet and Diamond Halo Gemstone Ring in 14K White Gold to be high quality, authentic jewelry, as described above.